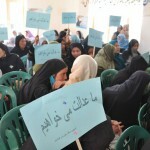 8 March 2011 – Hundreds of women carrying banners with “We Want Justice” written in Dari today urged provincial officials to make life better for women in Dai Kundi, where the United Nations body leading the global effort to empower women is due to open its first provincial office later this month. Dai Kundi women should not shy away from asserting their rights, said UNAMA Deputy Special Representative Martin Kobler speaking at the provincial Department of Women Affairs alongside UN Women Country Director, Christine Ouelette, and UNAMA’s Provincial Head of Office, Candace Karp. “Women should participate actively in social, cultural and political activities to help bring about justice for themselves,” the Deputy Special Representative said, adding that Article 22 of the Afghan Constitution ensures equality between men and women. He added that the UN is committed to supporting the women and men of Dai Kundi in that effort. The need for consent in marriage is part of the Law on Elimination of Violence against Women (EVAW) and the Convention on the Elimination of all forms of Discrimination against Women (CEDAW) – both ratified by the Government of Afghanistan. “Having these international and national legal frameworks means that continuous implementation is the task ahead – by all parts of society, including executors of justice, like the police and the courts, but also for communities and their traditional leaders,” the Deputy Special Representative said. Speaking at a round table later that day, Dai Kundi Governor Qurban Ali Oruzgan said violence against women arises from old superstitions and customs, plus differing tribal opinions. The Governor explained that violence against women includes high maternal mortality rates and lack of access to education. “We need women shelter and a better health service not just for women but for all Dai Kundi residents – we have only one female doctor in all of Dai Kundi,” he said. While education of boys and girls remains difficult, the situation has improved in the past seven year. Dai now has 114 high schools and 107 secondary schools, up from three high schools and a few secondary schools. Nearly half of its students are women, according to the Governor. Posted by Omid Jafari on Mar 10 2011. 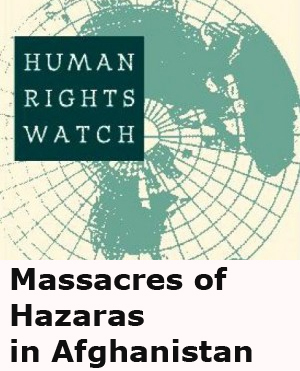 Filed under Afghanistan, Hazarajat, Women Rights. You can follow any responses to this entry through the RSS 2.0. Responses are currently closed, but you can trackback from your own site.